This 10.65 acre, 91,000 sf Retail and Office Development is located along the prominent Metcalf Avenue Corridor in South Overland Park. DeGasperi & Associates has been involved from inception of the development, providing Land Planning and Architecture. The undulating main backdrop is comprised of 5 multi-tenant retail buildings, including a two-story central building with 35,000sf of Office space on the second level. 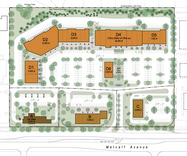 Three pad buildings align Metcalf; including a Tunnel Car Wash, a 7,000sf Multi-Tenant Retail Building, and a Drive-Thru Fast Food Restaurant. The center features an upscale 'Tuscan' inspired Architecture; utlizing stone veneers, rich-colored stuccos, and concrete barrel-tile roofs, accented with many ornamental elements and features.